FLIPfest has added an artistic component to this year’s festival, which runs all over downtown, Friday, Aug. 24-Aug. 26 with a market and a performance by Amy Nelson. 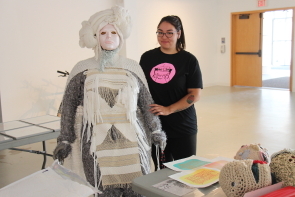 The exhibit, ’Intimacy,’ runs at The Dr. Penny Foster Building, Aug. 25-Sept, 14. It features female and non binary artists from as far away as Montreal. “It’s an artistic celebration of femme and non binary artists who are exploring the themes of body image and self love,” observed curator Kylie Fineday. The exhibit features the works of 19 artists who have submitted approximately 30 pieces including textile art, paintings and photographs. Winnipeg artist Mahlet Cuff is the featured artist of the exhibition who submitted a series of four photographs. “‘Beloved’ is about the feelings of disconnect and fracture,” said Casa curator Darcy Logan. 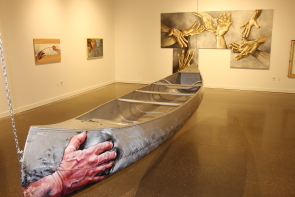 “Karen has focused on all of the people who have supported her in her life,” observed Casa curator Darcy Logan, looking at the canoe adorned with huge painted hands on either side. 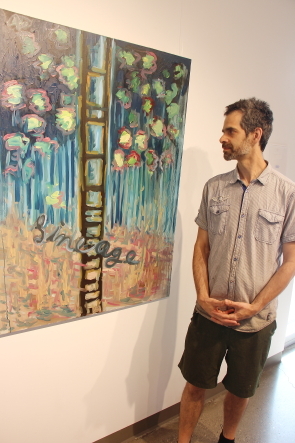 Local artist Rob Bechtel goes back to his originals influences for his new Exhibit “Lineage” in the Concourse Gallery, one of five new exhibits opening tonight, Jun e 23. “I started thinking of my influences when I was starting out as an artists. There are so many of them — a lot of twentieth century artists,” Bechtel said, noting his exhibit includes the oil and canvass works he is known for which he created at the McNally Arts Centre studio as well as ink on paper he completed at home. “ I can’t get to the studio every day, so I’ve been doing a lot more work on paper at home,” he observed, adding all of the works were completed in 2017 and 2018. 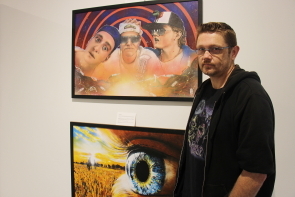 Local film-maker C Blake Evernden explores the history of movie poster design by looking back on his very earliest films for his movie poster themed exhibition “Cinematic Imaginings,” which opens at Casa tonight, Saturday, June 23. “I’ve been making movies since I was 11 or 12 and usually the budget wasn’t enough to reflect what was in my head. So I thought making a movie poster could better reflect it,” he said, adding the works include posters for short films and featured he’s completed throughout his career, but also three new films he is working on. 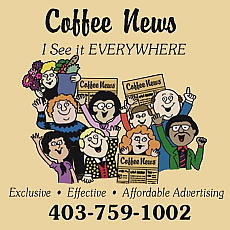 The new films include a romantic comedy set in, aptly, a movie theatre. “And on another of the new ones, I’ve used a couple actresses I hope to be working with on the film,” he said.